TRANSIT, TOURISM, INVESTMENTS, BUSINESS, CULTURE AND SPORT IN ONE "KEY"! Baltic Key – highlights and connects! Popularise and use favourable geographic location of your country! Offer your product + club reflector as a gift! What benefit do you get with the participation in the Baltic Key project and popularisation of the brand? With your participation, the advertised club’s Internet resource facilitates promotion and exchange of useful information and advertising. How to attract a client and increase market share without lowering prices? How to get ahead of a stronger competitor? How to promote new products on the market so that they are in demand? How to close faster deals? How to reduce advertising and marketing costs? How to make your brand, products and services stand out in relation to competitors? Business cards and booklets can be lost, and they don’t have the magic connection that Internet has. How are we different, you may ask? We do not encourage you to abandon traditional and individual advertising, but we suggest that you become a part of the Baltic Key club. You represent and popularise your country and your business, as well as participate in joint international advertising campaigns. Offer club reflectors for pedestrians as a priority promotional business card. 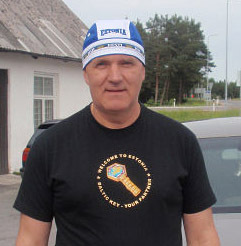 This way Baltic Key Club members promote the club website, while offering, advertising and selling their goods and services on its pages and contributing to promotion of the international movement “UN Decade of Action for Road Safety 2011-2020”. Let’s make our life on the road safer! “Every year 1.3 million people around the world are killed in road accidents, and 50 million people are injured or disabled. This grievous statistics is reflected in the United Nations Resolution 64/255. Road traffic injuries are one of the major public health concerns and one of the main causes of death worldwide. This is particularly true with respect to children and young people aged up to 29 years. Experts predict that if we continue to do nothing, by the year 2020 road traffic injuries will become the leading cause of death in low- and middle-income countries”. NB! We would like to invite representatives of business, culture and sport, as well as private persons, to become our partners. We welcome everybody who wants to take part in development and promotion of the socially important Internet project MTÜ Balti Kontakt (Baltic Key Club - www.B-KEY.eu). Dear friends! By using services and buying products of the Baltic Key Club you contribute to development of the socially important Internet project of MTÜ Balti Kontakt. We will also be very grateful to those people who can transfer a monetary amount within their possibilities to the settlement account of the non-profit association MTÜ Balti Kontakt. Payment description: "Helkur Baltic Key"
Please, do not view this information as an insistent demand. Make monetary contributions only if you can afford it and believe that your contribution and our activities will be directed to socially important and charitable causes. Join and make the Baltic Key brand popular, ADVERTISE YOURSELF and YOUR COUNTRY!